The most recent release of the Q d’etat line from SAG is the Howitzer. Released in the first week of May, they are starting to show up on shelves at your local tobacconists. They are packed in cabinets of ten and only 1,000 boxes were produced. Each box includes a card to sign up for Cigar Rights of America. Everyone should be a member of this grass-roots organization that protects your right to enjoy premium cigars. You can follow Quesada Cigars on the Matasa website and follow Terence Reilly and Raquel Quesada on Twitter. The Q d’etat line represents a symbolic revolt against the unfair taxation practices and mistreatment of the premium cigar industry. The brand is intended to create awareness of the dangers increased government regulation and taxation will produce, specifically the FDA’s desire to regulate premium cigars. There will be three sizes, released at different dates, of 1,000 ten-count boxes. Each box will contain a form to register for membership in Cigar Rights of America. 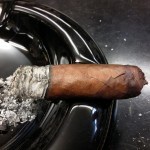 Construction and Appearance: The Howitzer is a nice looking cigar with double bands. The primary band is black with the Quesada ‘Q’ tobacco leaf in silver and gold and small Q’s around the band. The second band says Q d’etat Howitzer. It is an attractive brown wrapper but a little uneven in color and slightly bumpy. It is firmly packed and has what I would describe as a small triple cap. As a result I elect to use a v-cut to preserve as much of the cap as I can for what I anticipate will be an hour plus smoke. Flavor and Notes: The wrapper of the Howitzer has an acidic note with floral or citrus hints and an earthy foot with a similar floral or woody note. There is a notable absence of pepper and a presence of what I would describe a cilantro heat to the nose. The cold draw has the same notes with a gentle pepper left on the lips. Smoking Characteristics: After taking a v-cut, the initial light produces a nice amount of woody notes with hint of charcoal and a gentle cilantro heat evenly fills my mouth. The Howitzer has a sharp flavor profile that is complex but with no dominating flavor. 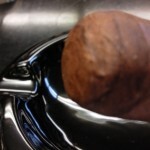 There is a slight mineral note that increases slowly but steadily as the cigar heats up. The first third continues this way with a firm gray ash that has the slightest tinge of brown to it. There is a very sharp burn line and an abundant amount of smoke is produced. The flavors are predominantly woody and cedar with a dry leathery finish. The mineral notes subside and are replaced with a black pepper and mixing with the still present cilantro heat. Flavors are centered in the middle of my tongue and roof of my mouth. Towards the end of the first third, the burn is slightly uneven but corrects itself without intervention and is more that acceptable but worth mention. Continued retrohales at this point reveal the floral notes initially detected before lighting and mixes with the mineral note that lingers. The second third sees the spiciness die down but the ash is still holding firm and true. The ash is now white gray and very firm and hols past the two inch point. An increase in leather and charcoal notes begins and is joined by a dark espresso. The last third remains pleasant but does not reveal any new notable flavors. The Howitzer continues to produce abundant smoke with a draw that is not loose, but satisfying. The mineral flavor continues to be present with leather notes and the strength builds through medium. The entire smoking time is in excess of seventy-five minutes. 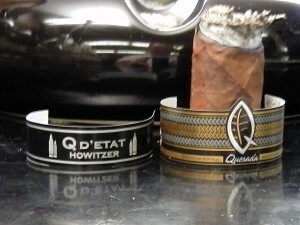 Conclusion: The Quesada Q d’etat Howitzer is a nice smoke, fulfilling, and definitely a cigar to try. I was disappointed that there were not some more prominent flavors that developed but that did not take away from the overall enjoyment of the cigar. I am sure that this will be an appealing cigar to many smokers and it will only be available for a limited amount of time.